The timing of the joint U.S.-Israeli meeting in December to discuss their strategy on Iran is suspicious, to say the least. Call me a conspiracy theorist but I can’t help wondering if they didn’t discuss how to foment and exploit anti-government protests in Tehran. Just as they had hijacked the anti-Assad regime protests in Syria at the start of the bloody conflict there. Is a similar process unfolding in the latest protests in Iran? In the run-up to the most recent protests both Israel and the Trump administration had been notably unforthcoming on Iran. Even as they hammered out the final policy details in a series of closed meetings. Are we seeing the results of those discussions in Iranian street protests? After all the U.S. has a long history of covert interference in Iranian politics stretching back to 1953, when it helped overthrow the democratically elected government of Premier Mohammed Mosaddeq to install the Shah of Iran. Then again in 2009, the Ayatollah Khamenei claimed that the CIA linked National Endowment for Democracy and the Royal Institute of International Affairs based at Chatham House, London, were behind protests over the disputed election results. Those claims were echoed by Paul Craig Roberts who likened U.S. interference to earlier “colour revolutions” in Ukraine and Georgia. Did Israel and the Trump administration agree in their December meeting on a renewed policy of regime change in Iran, commencing with anti-government street protests? Although the Western media has uniformly failed to address it that’s a serious question. The corporate media often works hand-in-glove with western governments to promote policies that might otherwise be unpopular. Think of the 2003 Iraq invasion and all the press speculation about Saddam’s WMD prior to that debacle. The media helped pave the way for military intervention by mentally conditioning a public who might otherwise have opposed it more sridently. Or consider the horror stories we were told about the Assad regime. Remember the reports about gas attacks, chemical weapons attacks and massacres that the Western media blamed on forces loyal to Assad? Even as Saudi funded and Western-backed proxies in ISIS were wreaking havoc in their efforts to oust him. The attacks were clearly attributable to Western backed proxies, although this was largely ignored by the Western media/propaganda machine. So when in regard to the latest unrest in Iran Tuesday’s Times of London declares: “West must seize this chance to change Iran” — there is good reason to be suspicious. In 2016 the same writer, Roger Boyes, voiced his support for Saudi Arabia claiming that it remained “our best hope for peace in the Middle East“. This was while the Saudis and their allies were wreaking havoc in Yemen and Riyadh was bankrolling ISIS in Syria and Iraq. To underline his call for Western intervention, in November Boyes urged that we must “Stop Iran’s march through the Middle East“. Essentially, Roger Boyes is calling for regime change in Iran. Trouble is he is not alone. Perhaps even more significantly, in January Trump will have to decide whether to re-impose sanctions on Iran or not. The timing of these protests couldn’t have been more convenient for the Iran hawks. Any sort of crackdown on the streets in Tehran now will provide Trump with ample justification for doing just that. 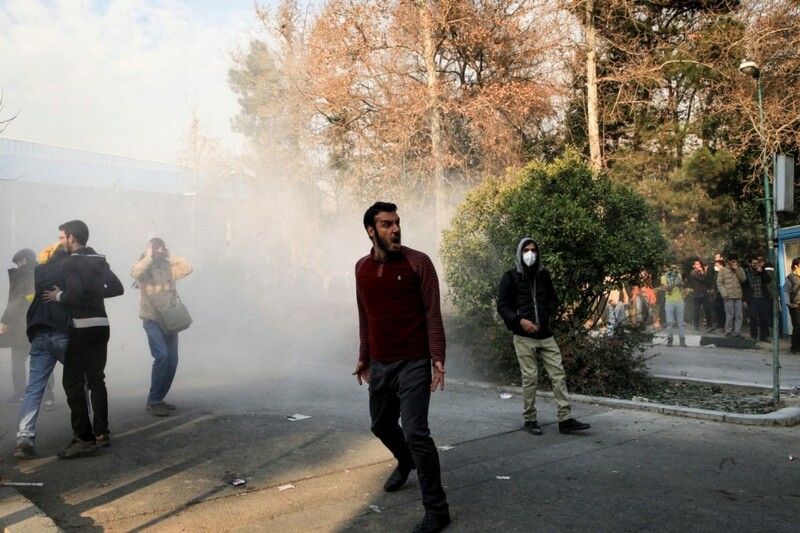 They may not realise it, but Iranian protesters are helping make the case for further U.S. intervention, covert or not. Ed. A delegation led by Israel’s national security adviser met with senior American officials in the White House earlier this month for a joint discussion on strategy to counter Iran’s aggression in the Middle East, a senior U.S. official confirmed to Haaretz. The meeting was part of an ongoing discussion between the two countries on the subject. According to the senior official, officials at the meeting also discussed Trump’s “comprehensive Iran strategy” and examined prospects to counter Iran’s activities in Syria. This discussion will become especially relevant in January when Trump will have to decide once again on whether or not to reimpose sanctions on Iran, a step that could lead to the collapse of the nuclear agreement signed by the Obama administration in 2015.